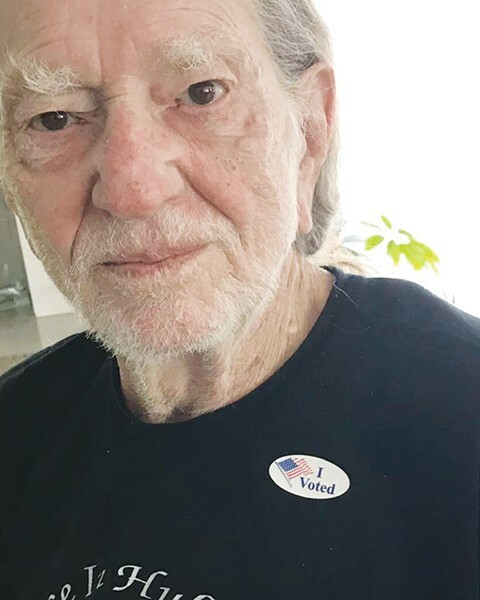 Fresh from flipping the bird Johnny Cash–style in support of Beto O'Rourke's failed Texas senate bid, country-western pothead Willie Nelson (pictured) is set to earn the 2018 Lifetime Achievement Award at this year's Emerald Cup, which goes down at the Sonoma County Fairgrounds on Dec. 15–16. The Bohemian plans to be there this year for gavel-to-gavel coverage of the annual pot event, and we're already humming this Willie Nelson and Merle Haggard tune ("It's all Going to Pot") in anticipation of a smoke-filled Emerald Cup going down in the presently scary as hell, smoke-filled state: "Well, it's all going to pot / Whether we like it or not / The best I can tell / The world's gone to hell / And we're sure gonna miss it a lot." . . .
Thanksgiving is all about family, tradition and gratitude—so why not start a new family tradition and express gratitude for a marijuana deep-fried turkey recipe that appeared in the Nugget's inbox, not unlike a stoned pilgrim washed ashore in some new and unruly land. It's not too late to cook this bird, and there's not much to the recipe, really—all you need is a turkey, some pot, an injector and a big outdoor fryer. And a fire extinguisher. Some oven mitts, too. Check out Cannabis Cheri's recipe at cannabischeri.com, where she's got lots of other high-on-the-holidays cooking tips for cannabis lovers. . . .
Several years ago, an enterprising young person in San Francisco set out to sell some Girl Scout cookies and thought it a good idea to set up shop outside a cannabis dispensary. Sales were brisk! She sold something like 300 boxes of cookies in two hours, and raked in some $1,500, according to 2014 news reports about the young marketing phenom. Now comes news from our pot pals at Leafly.com about a hybrid strain out there called GSC, formerly known as Girl Scout Cookie. We suspect an encounter with trademark officials prompted the shortened name change, since this stuff's strictly adults-only. The strain combines OG Kush (a favorite of the Nugget) with Durban Poison to create a flavor encounter described as sweet and earthy, just like us—and there's even a sub-brand called Thin Mint GSC, which is advertised as providing a powerfully psychoactive encounter, with lots of pain-relieving qualities as well. Does unrelenting psychic pain count? We can only hope. Leafly's reporting that the GSC is available at several nearby dispensaries, including Cali Xpress in Santa Rosa—home of the $99 Ounce! Alas, the Thin Mint version's a little trickier to come by in local stores. In the meantime, the Nugget eagerly awaits a Samoa Sativa special hybrid or a Potent Peanut Butter Patty—and will keep readers posted on any and all cookie-related developments on the cannabis front.